For other uses, see Pony (disambiguation). A Highland Pony, demonstrating the pony characteristics of sturdy bone, thick mane and tail, small head, and small overall size. A pony is a small horse (Equus ferus caballus). Depending on context, a pony may be a horse that is under an approximate or exact height at the withers or a small horse with a specific conformation and temperament. There are many different breeds. Compared to other horses, ponies often exhibit thicker manes, tails and overall coat, as well as proportionally shorter legs, wider barrels, heavier bone, thicker necks, and shorter heads with broader foreheads. The word pony derives from the old French poulenet, meaning foal, a young, immature horse, but this is not the modern meaning; unlike a horse foal, a pony remains small when fully grown. On occasion, people who are unfamiliar with horses may confuse an adult pony with a foal. The ancestors of most modern ponies developed small stature because they lived on the margins of livable horse habitat. These smaller animals were domesticated and bred for various purposes all over the Northern Hemisphere. Ponies were historically used for driving and freight transport, as children's mounts, for recreational riding, and later as competitors and performers in their own right. During the Industrial Revolution, particularly in Great Britain, a significant number were used as pit ponies, hauling loads of coal in the mines. Ponies are generally considered intelligent and friendly. They are sometimes also described as stubborn or cunning. Properly trained ponies are appropriate mounts for children who are learning to ride. Larger ponies can be ridden by adults, as ponies are usually strong for their size. In modern use, many organizations define a pony as a mature horse that measures less than 14.2 hands (58 inches, 147 cm) at the withers, but there are a number of exceptions. Different organizations that use a strict measurement model vary from 14 hands (56 inches, 142 cm) to nearly 14.3 hands (59 inches, 150 cm). Many breeds classify an animal as either horse or pony based on pedigree and phenotype, no matter its height. Some full-sized horses may be called ponies for various reasons of tradition or as a term of endearment. A pony foal. Pony foals are smaller than standard horse foals, but both have long legs and small bodies. For many forms of competition, the official definition of a pony is a horse that measures less than 14.2 hands (58 inches, 147 cm) at the withers. Standard horses are 14.2 or taller. The International Federation for Equestrian Sports defines the official cutoff point at 148 centimetres (58.27 in) (just over 14.2 h) without shoes and 149 centimetres (58.66 in) (just over 14.2–1/2 h) with shoes, though allows a margin for competition measurement of up to 150 centimetres (59.1 in) (14.3 h) without shoes, or 151 centimetres (59.45 in) (just under 14.3–1/2 h) with shoes. However, the term "pony" can be used in general (or affectionately) for any small horse, regardless of its actual size or breed. Furthermore, some horse breeds may have individuals who mature under that height but are still called "horses" and are allowed to compete as horses. In Australia, horses that measure from 14 hands to 15 hands are known as a "galloway", and ponies in Australia measure under 14 hands. People who are unfamiliar with horses may confuse an adult pony with a young, immature horse. While foals that will grow up to be horse-sized may be no taller than some ponies in their first months of life, their body proportions are very different. A pony can be ridden and put to work, while a foal is too young to be ridden or used as a working animal. Foals, whether they grow up to be horse or pony-sized, can be distinguished from adult horses by their extremely long legs and slim bodies. Their heads and eyes also exhibit juvenile characteristics. Furthermore, in most cases, nursing foals will be in very close proximity to a mare who is the mother (dam) of the foal. While ponies exhibit some neoteny with the wide foreheads and small size, their body proportions are similar to that of an adult horse. Ponies originally developed as a landrace adapted to a harsh natural environment, and were considered part of the "draft" subtype typical of Northern Europe. At one time, it was hypothesized that they may have descended from a wild "draft" subspecies of Equus ferus. Studies of mitochondrial DNA (which is passed on though the female line) indicate that a large number of wild mares have contributed to modern domestic breeds; in contrast, studies of y-DNA (passed down the male line) suggest that there was possibly just one single male ancestor of all domesticated breeds. Domestication of the horse probably first occurred in the Eurasian steppes with horses of between 13 hands (52 inches, 132 cm) to over 14 hands (56 inches, 142 cm), and as horse domestication spread, the male descendants of the original stallion went on to be bred with local wild mares. Domesticated ponies of all breeds originally developed mainly from the need for a working animal that could fulfill specific local draft and transportation needs while surviving in harsh environments. The usefulness of the pony was noted by farmers who observed that a pony could outperform a draft horse on small farms. By the 20th century, many pony breeds had Arabian and other blood added to make a more refined pony suitable for riding. Ponies are seen in many different equestrian pursuits. Some breeds, such as the Hackney pony, are primarily used for driving, while other breeds, such as the Connemara pony and Australian Pony, are used primarily for riding. Others, such as the Welsh pony, are used for both riding and driving. There is no direct correlation between a horse's size and its inherent athletic ability. Ponies compete at events that include show hunter, English riding on the flat, driving, and western riding classes at horse shows, as well as other competitive events such as gymkhana and combined driving. They are seen in casual pursuits such as trail riding, but a few ponies have performed in international-level competition. Though many exhibitors confine themselves to classes just for ponies, some top ponies are competitive against full-sized horses. For example, a 14.1 hand pony named Stroller was a member of the British Equestrian show jumping team, and won the silver medal at the 1968 Summer Olympics. More recently, the 14.1-3/4 hand pony Theodore O'Connor won the gold medal in eventing at the 2007 Pan American Games. Pony Clubs, open to young people who own either horses or ponies, are formed worldwide to educate young people about horses, promote responsible horse ownership, and also sponsor competitive events for young people and smaller horses. In many parts of the world ponies are also still used as working animals, as pack animals and for pulling various horse-drawn vehicles. They are used for children's pony rides at traveling carnivals and at children's private parties where small children can take short rides on ponies that are saddled and then either led individually or hitched to a "pony wheel" (a non-motorized device akin to a hot walker) that leads six to eight ponies at a time. Ponies are sometimes seen at summer camps for children, and are widely used for pony trekking and other forms of Equitourism riding holidays, often carrying adults as well as children. The Shetland pony is one of the smallest pony breeds, but is very strong. Ponies are often distinguished by their phenotype, a stocky body, dense bone, round shape and well-sprung ribs. They have a short head, large eyes and small ears. In addition to being smaller than a horse, their legs are proportionately shorter. They have strong hooves and grow a heavier hair coat, seen in a thicker mane and tail as well as a particularly heavy winter coat. Pony breeds have developed all over the world, particularly in cold and harsh climates where hardy, sturdy working animals were needed. They are remarkably strong for their size. Breeds such as the Connemara pony, are recognized for their ability to carry a full-sized adult rider. Pound for pound ponies can pull and carry more weight than a horse. Draft-type ponies are able to pull loads significantly greater than their own weight, with larger ponies capable of pulling loads comparable to those pulled by full-sized draft horses, and even very small ponies are able to pull as much as 450 percent of their own weight. Nearly all pony breeds are very hardy, easy keepers that share the ability to thrive on a more limited diet than that of a regular-sized horse, requiring half the hay for their weight as a horse, and often not needing grain at all. However, for the same reason, they are also more vulnerable to laminitis and Cushing's syndrome. They may also have problems with hyperlipemia. Ponies are generally considered intelligent and friendly, though sometimes they also are described as stubborn or cunning. The differences of opinion often result from an individual pony's degree of proper training. Ponies trained by inexperienced individuals, or only ridden by beginners, can turn out to be spoiled because their riders typically lack the experience base to correct bad habits. Properly trained ponies are appropriate mounts for children who are learning to ride. Larger ponies can be ridden by adults, as ponies are usually strong for their size. The Connemara pony is a larger pony which occasionally matures over 14.2 hands. For showing purposes, ponies are often grouped into small, medium, and large sizes. Small ponies are 12.2 hands (50 inches (130 cm)) and under, medium ponies are over 12.2 but no taller than 13.2 hands (54 inches (140 cm)), and large ponies are over 13.2 hands but no taller than 14.2 hands. The smallest equines are called miniature horses by many of their breeders and breed organizations, rather than ponies, even though they stand smaller than small ponies, usually no taller than 38 inches (97 cm) at the withers. However, there are also miniature pony breeds. The full-sized horses used for polo are called "polo ponies," even though they are taller than ponies. Some horse breeds are not defined as ponies, even when they have some animals that measure under 14.2 hands. This is usually due to body build, traditional uses and overall physiology. Breeds that are considered horses regardless of height include the Arabian horse, American Quarter Horse and the Morgan horse, all of which have individual members both over and under 14.2 hands. The Icelandic horse is considered a horse, not a pony, by those who own and breed them. Other horse breeds, such as Icelandic horse and Fjord horse, may sometimes be pony-sized or have some pony characteristics, such as a heavy coat, thick mane, and heavy bone, but are generally classified as "horses" by their respective registries. In cases such as these, there can be considerable debate over whether to call certain breeds "horses" or "ponies." However, individual breed registries usually are the arbiters of such debates, weighing the relative horse and pony characteristics of a breed. In some breeds, such as the Welsh pony, the horse-versus-pony controversy is resolved by creating separate divisions for consistently horse-sized animals, such as the "Section D" Welsh Cob. Some horses may be pony height due to environment more than genetics. 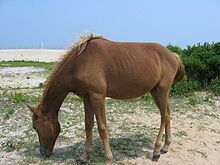 For example, the Chincoteague pony, a feral horse that lives on Assateague Island off the coast of Virginia, often matures to the height of an average small horse when raised from a foal under domesticated conditions. Conversely, the term "pony" is occasionally used to describe horses of normal height. Horses used for polo are often called "polo ponies" regardless of height, even though they are often of Thoroughbred breeding and often well over 14.2 hands. American Indian tribes also have the tradition of referring to their horses as "ponies," when speaking in English, even though many of the Mustang horses they used in the 19th century were close to or over 14.2 hh, and most horses owned and bred by Native peoples today are of full horse height. The term "pony" is also sometimes used to describe a full-sized horse in a humorous or affectionate sense. The United States Pony Club defines "pony" to be any mount that is ridden by a member regardless of its breed or size. Persons up to 25 years old are eligible for membership, and some of the members' "ponies" actually are full-size horses. Wikimedia Commons has media related to Ponies. Look up pony in Wiktionary, the free dictionary. ^ Bennett, Deb (1998). Conquerors: The Roots of New World Horsemanship (First ed.). Solvang, CA: Amigo Publications, Inc. p. 7. ISBN 0-9658533-0-6. OCLC 39709067. ^ Jansen, Thomas; Forster, Peter; Levine, Marsha A.; Oelke, Hardy; Hurles, Matthew; Renfrew, Colin; Weber, Jürgen; Olek, Klaus (6 August 2002). "Mitochondrial DNA and the origins of the domestic horse". PNAS. 99 (16): 10905–10910. doi:10.1073/pnas.152330099. PMC 125071. PMID 12130666 – via www.pnas.org. ^ a b Anthony, David W. (2007). The Horse, the Wheel, and Language: How Bronze-Age Riders from the Eurasian Steppes Shaped the Modern World. Princeton, NJ: Princeton University Press. pp. 196–197, 202. ISBN 978-0-691-05887-0. ^ Sponenberg, D. Phillip (1996). "The Proliferation of Horse Breeds". Horses Through Time (First ed.). Boulder, CO: Roberts Rinehart Publishers. pp. 155, 170–173. ISBN 1-57098-060-8. OCLC 36179575. ^ a b c d e f g "Pony Power! ".